appy Monday everyone! I hope you all had a great weekend, I know I did! The snow was a little bit of a surprise though. I mean it’s march… bring on the spring weather already! 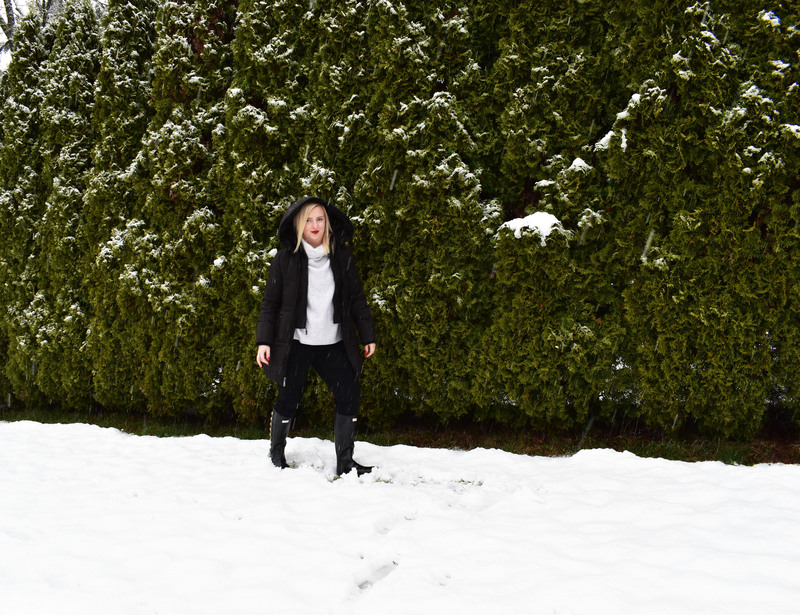 This did give me a reason to pull out my hunter wellies again [which I swear is only done in Vancouver when it snows] most people have real snow boots. Either way, they kept my toes warm and dry! These boots were shipped all the way from Europe because I just had to have the cute button design up the sides, it’s all in the details honey. To be honest, they were shipped from Europe…to Arizona…and then brought home to Canada! It was quite the trek to get them here but it had to happen! I like making everything a little more unique if possible. I love coming home with a new statement piece and prepping an outfit to go with it. Whether it be a purse, boots, belt, or even just lipstick, I can’t wait to start pairing things together. Its always been easy for me styling things together because i like classic pieces. It’s the wow factor that I love adding to my outfits but keeping it classy at the same time. Pairing these wellies with a cozy sweater and a pop of red lipstick made for a cute outfit when going out in this crazy weather. Handbags and shoes have always been my weakness [like every girl I bet.] I think it’s because, first of all, designer bags aren’t cheap. It takes me months to make a decision on which one I want to splurge on and how it will tie together with my wardrobe. I will go into the store and stare at it online forever before I actually purchase it [if I even do] because I am so particular. I do have to say, Louis Vuitton is my favourite for an everyday bag, they are just so big [ad I love me a big bag.] Chanel or Gucci would be more of my special occasion, night on the town kind of bag. I am really fortunate to have a few of these, but I work hard to get them! These are pieces I will have forever, don’t forget. It’s something you save up for, for a long time and once you get it, it almost feels like an accomplishment [I know it sounds ridiculous to a lot of you, but to each their own.] It’s really just what I like, some people like going all out on a vacation, I like to spend my money on bags! While the process for buying bags is quite detailed, shoes is not as bad. I like spending money on quality in this department, it gets frustrating when you buy shoes and they last a month before they fall apart. Spending the extra money is usually worth it when it comes to shoes, especially boots. Real leather is where its at these days [and you may even be able to wear them next season, if you protect them properly.] I never settle with the first thing I see, like these wellies for example. There are hundreds of hunter boots all over, but no one carried this specific design in Canada. I did have to wait an extra month to have them, but it was well worth it, I get compliments on them all of the time and I have had them for a few years now. Moving on to accessories. I am always down for a little charm as a finishing touch. I like to wear the jewelry my boyfriend has bought me because it means a lot to me. I know how hard he works and the decisions he has to make to chose it and that makes it much more special to me. I’m more of a necklace and belt kind of girl. You’ll see I wear the same ring in every photo on my left hand [no I am not engaged] I have always worn a ring on my left hand for no specific reason- but I do have a heart tattoo on my right ring finger, and I like that to be seen! It’s apart of who I am! Lipstick is a must –any colour. I’m feeling brighter pinks at the moment, but experimenting is the best to find what you love! It always finishes a look, in my opinion. These are just a few little things I look at when styling day to day outfits.